Curitiba, Brazil has one of the world’s highest rates of green space per capita and is considered a top city for walkability. Photo by Jardim Botânico/Flickr. Streets perform a necessary function in the life of cities, like the arteries of a complex, urban organism. As the Project for Public Spaces notes, city streets “animate the social and economic life of communities” by serving as primary sites for community interaction and exchange. However, many cities have historically developed their streets merely as passages for moving cars, and have neglected the vital role of streets as public places. Cars do a great job of transporting people and goods when they figure into a greater system of transport that’s efficient and doesn’t depend excessively on any single mode. When unrestrained, however, car use can become toxic to city life, depressing economic activity, hurting public health, and directly threatening the safety of drivers, pedestrians, and cyclists. While cars will remain a necessary component of urban transport for years to come, it’s worth asking whether they should be the dominant means of mobility on every city street, or even have a presence on some streets at all. Some cities are rethinking their streets by developing “green corridors” that (re)incorporate elements of the area’s natural ecosystem into the urban environment. The goals and purposes of these greening projects are diverse, ranging from enhanced social cohesion to environmental restoration, though they almost always aim at creating a sense of place that is human-oriented, not car-centered. The vision for Cali, Colombia’s car-less green corridor, for example, combines a need for low-income housing and a desire for ecological balance. The project will be built on 15 kilometers of old railway and will offer bus rapid transit (BRT) connectivity, bike lanes, pedestrian paths, and cultural facilities for concerts, art exhibitions, sports, and outdoor festivals, while also preserving indigenous plant life. What makes Cali’s green corridor particularly compelling, however, is its recognition of access to transport as an enabler for social mobility. The city’s goal is for every resident to be within 300 meters of a BRT station. Similarly, Curitiba, Brazil has transformed its once-congested urban fabric into a vibrantly green paradise, but has done so with a different perspective on development. Instead of overhauling entire sections of the city, Curitiba has approached greening at a much more granular level, redeveloping small patches of land into pedestrian-friendly public spaces. The city currently has 16 parks, 14 forested areas, and more than 1,000 smaller plots designated for trees and vegetation—all of which amounts to an impressive 560 square feet of green space per person. Furthermore, the city has integrated these green spaces into the urban streetscape by designating large portions of the downtown as car-free. 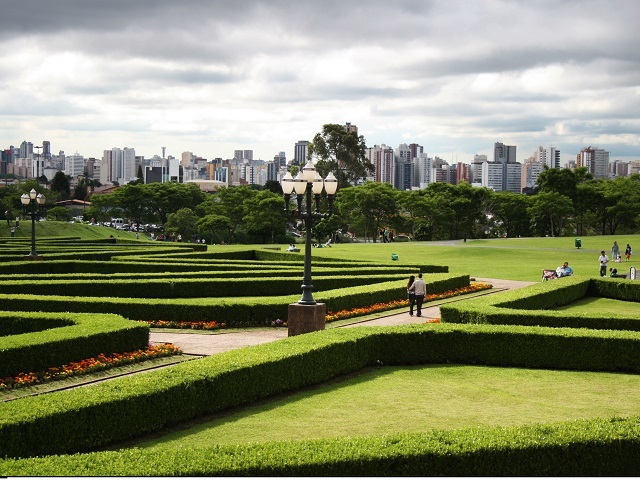 Rather than causing residents to abandon the downtown due to inaccessibility, Curitiba has been successful in making these green public spaces walkable and popular. This is due largely to the city’s investment in creating a BRT system that is integrated, reliable, and relatively cheap. 70 percent of Curitiba’s residents use public transit. And in China, the western city of Chengdu is currently exploring ambitious ways to mitigate car-oriented sprawl in its surrounding suburbs. One proposal currently in development is the complete creation of an entirely new city in which “cars will be essentially unnecessary.” Like Curitiba and Cali, this new city will ensure that its residents are minutes from public parks—green areas that protect natural wildlife habitats as much as they facilitate social interactions. These green spaces should be easily accessible by foot, as the city will likely be entirely walkable and half of all road space will be designated for non-motorized traffic. However, Chengdu’s new urban project goes beyond other green corridors in its progressive approach to waste management. The city will also develop an eco-park to treat wastewater and solid waste, generating power for the city. The architects of the project expect to cut energy use by 48 percent, water use by 58 percent, and waste by 89 percent, compared to other, similar developments. Green corridors aren’t feasible everywhere and represent just one of the ways that cities can reimagine their underlying structure to be more people-oriented by design. But, generally, by prioritizing green spaces and overall car reduction, cities can become more sustainable, economically vibrant, and socially cohesive places to live. The first step? Reimagining city streets as places for people.